When a skier and businessman had an idea for a new way to easily transport skis to and from the slopes he approached to Red Splash to help turn his idea into reality. We started off with some on-line research amongst skiers to check the validity of the product, who would be its key target audience, the price point and essential design factors. Using this information we then briefed and worked with industrial product designers and specialist plastics manufacturers to arrive at a robust product design. With the product at prototype stage we then created the name and brand logo for the product and developed a website and a short video designed to inform potential business partners of the opportunity. In order to manufacture the product in volume and market it we also wrote a business plan, including the sales and marketing strategy, and engaged with a crowd funding site in order to raise the extra money needed to take the product to market. 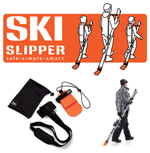 Ski Slipper is now poised to launch into the European and US markets. Superman was a new energy drink for the UK and Red Splash was asked to help with the packaging, launch strategy and initial distribution. The energy drink market is a very busy one with high profile brands and a number of low cost supermarket own brands. However we felt that Superman offered something different and through focus group research arrived at a proposition that resonated with our target audience and clearly set Superman apart from its competitors. Based on our research we developed a portfolio of marketing and point of sale materials ready for distribution. Working with our specialist sales partners we chose to target the “stop and go” buyer looking for an immediate energy boost rather than the weekly shopper who tended to purchase on price. We created a sales and marketing strategy for Superman based upon distribution and high brand visibility in garages and corner shops rather than the big five supermarkets. With the ability to offer healthy margins to these retail partners we quickly grew a significant distribution base using high profile promotional activities to drive consumer trial giving Superman a strong foothold which led to the drink being stocked for wider distribution through selected wholesalers. When two young designers came to Red Splash with Kickster, their idea for a light and easy to erect football goal, we helped them realise their dreams of taking their product to market. Initially we researched the positioning and branding of Kickster using focus group and looked at how easy the product was for the target audience of children, parents and coaches to assemble, disassemble and transport. We passed all of this information to the design team who refined the product ready for market. Armed with the positioning research we then created a sales and marketing strategy and a “to market” business plan to enable the team to gain traction against their competitors in the marketplace. After its successful launch, Kickster sold strongly and is now an established brand selling through many of the major high street and on-line retailers both in the UK and other countries around the world. The team continue to develop new derivatives of the concept both for football and also for other sports. Regardless of what point you have reached in the process of taking your idea or product to market we have the services, experience and expertise to make the rest of your journey a success. Check the market validity of your idea • Find out what products it will be competing against • Determine who will buy it • Assess how much will they pay for it and why • Use all of this knowledge to develop your product or service into something the market finds attractive and most importantly will pay for. How to package it • How to position it • Who best to sell it to • How to tell them about it • How to sell it to them. Research to test the product proposition, the scale of the opportunity, the key target audience, how much they will pay, how they will buy. Product Engineering to produce prototypes, final production samples, support for the manufacturing process and selection of suppliers. Legal Support to help you protect the idea, register trademarks and structure the company. Raising Finance with the preparation of a Business Plan and putting this in front of Angel Investors, Crowd Funding and other investment vehicles. Design of the brand which the customer buys into and which represents your product or service through its logos, packaging, website and other marketing materials. Advertising to create powerful messages that sell the product or service through cost effective media options to the target audience. Media Planning to work out how best to reach our target audience with our key messages, where to best reach them most cost effectively, including on-line, digital, social media, press, television, radio and a whole mix of other media options to deliver the best return on investment. Sales Strategy because regardless of the strength of the product or service someone, somehow has to go out and sell it - we have trusted contacts who we have worked with previously that we can introduce you to and who we know will do a great job for you. Call us now to discuss how we can help you get your products or services cost-effectively to market.